First released in cinemas in 1962, The Day of the Triffids is an entertaining sci-fi movie based on the classic John Wyndham novel. Starring Howard Keel (Kiss Me Kate and TV's Dallas) and Janette Scott (daughter of the late Dame Thora Hird) The Day of the Triffids is released for the first time ever on DVD by Partner Entertainment the new label from BBC Worldwide on 30th June 2003. The Day of the Triffids sees fine performances from the leads, is full of suspense and is a well-paced, faithful adaptation of the book. The Day of the Triffids is a fantastic movie that still holds up well after over 40 years and is a must-buy DVD for all fans of classic British Black & White sci-fi movies. It is released to own on DVD from Partner Entertainment on 30th June 2003, priced £9.99. 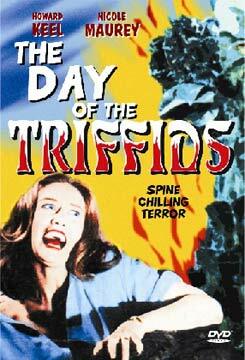 The Day of the Triffids recently featured in Total Film magazine's "top 10 remakes we'd pay to see".